November 15, 2016 -- Further evidence has emerged of the increasing skills shortage across Europe. The population pyramid of radiologists in France could be seen as a ticking time bomb, while growth rates of CT and MRI in Sweden have continuously exceeded growth rates of practicing radiologists, according to a new report from telemedicine firm TMC. The combination of an aging population and a stagnating supply of radiologists are poised to leave some countries with a severe shortage of radiologists able to interpret CT and MR images. Furthermore, the gap between supply and demand is leading to fast-rising workloads for radiologists that governments and institutions will need to address urgently across several European countries, stated the authors of the 13-page report. 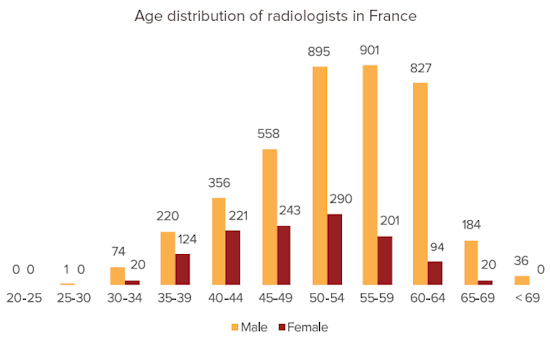 Age distribution of radiologists in France. All charts courtesy of TMC. France, which performs more CT exams than any other country in Europe, faces a double threat regarding its radiologist population. First, the average age of its consulting radiologists was 51 years in 2010, the authors stated. Second, the distribution of radiologists in the workforce is unequal and ill-suited to the provision of country-wide imaging services. Most consultants are concentrated around Paris and the Mediterranean coast, while the population is situated broadly throughout the country. Germany does twice as many x-ray and MRI scans than most other countries on a per-capita basis, but it can only do so following the questionable practice of nonradiology specialists interpreting x-ray for themselves, the report stated. On the plus side, the growth rates of cross-sectional exams have decreased over recent years and reached better alignment with radiologist growth rates. In Sweden, the growth rates of CT and MRI have mostly exceeded the growth rates of radiologist capacity, which is an alarming trend, the authors wrote. About 100 radiologists are undergoing training to become specialists, which is exactly the shortage of specialists today according to the Swedish National Board of Health and Welfare (Social Styrelsen), but experts fear this shortage will reach 500 within five years. The Swedish government has introduced referral guidelines so that unnecessary exams are not performed and exams are appropriate. This should help Sweden to reach a balance of demand and capacity by 2025. 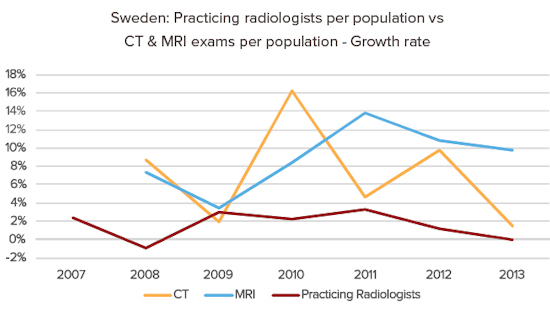 Growth rates of CT and MRI in Sweden have continuously exceeded growth rates of practicing radiologists. For CT and MRI exams, Denmark started at a significantly lower level, but surpassed Sweden in 2013. This was not met with a similar increase in the number of reporting radiologists, but a stabilization of volume growth was achieved in 2012. A report from the Danish Health and Medicines Authority (Sundheds Styrelsen) confirmed that Denmark is facing similar challenges to other European countries. There is a clear concern about allocation of scarce resources and the need to implement tight controls to avoid unnecessary scans in the future. The U.K. has the most severe capacity challenge and the lowest number of practicing radiologists per capita, which will render it unable to meet demand in coming years, they warned. Currently, the U.K. has just 4.7 practicing radiologists per 100,000 population, the lowest number of any country analyzed. The country would need to add eight full-time-equivalent radiologists per 100,000 people to meet demand. Radical solutions will be needed to support the present workforce and help them to work efficiently. The huge gap in the U.K. between demand and capacity becomes clear when looking at the numbers. The Royal College of Radiologists (RCR) stated that 4,370 full-time-equivalent (FTE) radiologists would have been needed to handle case volumes in 2015, but only 2,548 FTE radiologists were available, a shortfall of nearly 2,000 FTE radiologists. The shortage is causing delays in diagnosis and treatment, the report stated. In 2014, additional paid reporting by contract radiologists was used to help fill the gap in almost four of five radiology departments. Fifty-eight percent of departments used outsourcing, and 48% used ad hoc locum tenens. Potential solutions include sequence reductions, radiographer reporting, demand management, and collaborative radiology networks, the authors wrote. Radiology networks in particular are getting increased attention, with several reports from the RCR attesting to the value they can provide, according to the report. Several U.K. trusts are working together to try to fill the service gap. The Working Together program in Yorkshire and Derbyshire connects seven National Health Service (NHS) trusts.